APRIL 01, 2019 - GERTRUDE announces the launch of the BRNDHAUS™ on April 1, 2019, coinciding with the momentous 100th anniversary of the German art school Staatliches Bauhaus, commonly known as “Bauhaus,” in operation since 1919. The Bauhaus’ indelible influence on the development of modernist arts, architecture, and design during the 20th century is the inspiration for the BRNDHAUS’ modern aesthetic and founding purpose as a place to cultivate and nurture memorable brands and brand experiences while aligning the city’s creative leaders, thinkers, and doers. The BRNDHAUS is the new HQ for global innovation, brand development, advertising, and marketing services consultancy GERTRUDE, INC. and the agency’s two divisions OZ MFG. COMPANY™ (Design) and RAYE™ (Experiential & Architecture). As the BRNDHAUS embarks on a new chapter as “A Mid-Century Mondernist-Inspired Innovation Brand Factory,” we pay respect and admiration to the Bauhaus school’s 100 years of innovation. The BRNDHAUS is scheduled to open its doors October 1, 2019. FEBRUARY 28, 2019 - GERTRUDE is pleased to announce the return of Newcity’s marquee design issue, Design 50: Who Shapes Chicago highlighting the behind-the-scene forces who bring Chicago’s worlds of design to life by driving the creation of form, function and beauty—from architecture and home, to fashion, product and graphic design. Considering leadership, influence and vision as its principal measures, here’s those who lead Chicago’s design ecosystem into steady, collaborative growth, those who make a splash putting the city in the national and international spotlight and those, whose up-and-coming nature doesn’t compromise their big ventures, visions and ideas. FEBRUARY 28, 2019 - Global brand development, innovation, advertising, and marketing services consultancy GERTRUDE, INC. has purchased and is refurbishing a 35,000 sq. ft. warehouse property located on seven contiguous lots at 1725-41 W. 21st Street in the heart of Chicago’s dynamic Pilsen neighborhood. Creatively owned and operated, the BRNDHAUS brings a distinct creative texture rooted in modernist design, and anchored by GERTRUDE’s branding and innovation expertise, to Pilsen’s landscape—aligning and inspiring professionals across advertising, architecture, branding, co-working, exhibit, fashion, film, and media arts, to grow with and imprint upon this singular neighborhood that was recently named by FORBES as one of the Top 12 Coolest Neighborhoods in the world. The BRNDHAUS is the new global HQ for Chicago-London-New York based GERTRUDE, INC. and the agency’s two divisions OZ MFG. COMPANY™ (Design) and RAYE™ (Experiential & Architecture). The BRNDHAUS also offers a host of premium rental opportunities for Offices, Membership, Events, Pop-Ups, and Production Studios, along with a suite of amenities including the CHANGE BUREAU™ Speaker Series, WRK IN PRGRSS™ Private Bar, Kafe Arlo™, TOKYO21 GLLRY™, BRNDHAUS GNRL STORE™, and large outdoor space, the FLORA GARDEN™. The BRNDHAUS celebrates its official opening in 2019 to coincide with the momentous 100th anniversary of the German art school Staatliches Bauhaus, commonly known as “Bauhaus,” that opened April 1, 1919. The Bauhaus’ indelible influence on the development modernist arts, architecture, and design during the 20thcentury is the inspiration for the BRNDHAUS’ modern aesthetic and founding purpose as a place to cultivate and nurture memorable brands and brand experiences while aligning the city’s creative leaders, thinkers, and doers. FEBRUARY 18, 2019 - It’s bold. It’s minimal. It’s functional. After a hundred years, Bauhaus design continues to inspire artists, graphic designers and architects across the globe. FEBRUARY 01, 2019 – GERTRUDE enters its 14th year of challenging brands to “DISRUPT, INVENT, and EVOLVE” with forward thinking, expertly crafted ideas, and solutions that elevate brands and open new avenues for growth. The noteworthy date also marks the 5th birthday for the agency's Design division OZ MFG. COMPANY and the 3rd successful operational year for Experiential & Architecture division RAYE. Always looking ahead, the agency recently broke ground on a newly acquired 35,000 sq. ft. property located on seven city lots in the heart of Pilsen. The soon-to-be-named building and “Innovation Brand Factory” will serve as the global headquarters for GERTRUDE, INC., OZ MFG. COMPANY, and RAYE. Some notable GERTRUDE clients include: DIAGEO, Dunkin', Mars Wrigley, Midnight Pig Beer, MillerCoors, PepsiCo, Phoenix, Procter & Gamble, Red Bull, and Sonas Hospitality Co.
JANUARY 07, 2019 - GERTRUDE, in collaboration with the agency’s Design division OZ MFG. COMPANY, has reimagined packaging design to innovate and modernize leading cranberry juice brand Ocean Spray. GERTRUDE & OZ MFG COMPANY’s industrial and structural design teams conceived the “Wave Bottle,” a sleek, stylish, and sustainable package with an all new structural design that spotlights the brand’s iconic wave branding device, creating a completely ownable bottle shape to Ocean Spray rooted in the brand design. The “wave bottle” portfolio includes an updated shelf stable version made of bio-degradable plastic available in 64 oz. and 32 oz. sizes, along with an all new reusable stainless steel bottle, available in 10 oz. and 32 oz. sizes. The concept was designed with three key strategies in mind: Elevate the Ocean Spray brand image among both core and new, younger users through design and sustainability; Broaden usage occasions beyond at-home by making the product design fit among other brands that are a part of their lifestyle; and Expand the brand’s presence beyond the traditional shelf (i.e. cooler, liquor aisle, and on-premise). The newly proposed stainless steel variation also features a series of limited-edition bottles, each with a unique sculptural shape, and identity to match, to further augment a more contemporary, design-led portfolio line for Ocean Spray. JULY 05, 2018 - With a clear path to indelibly marking the agency’s 14th year on Feb. 1, 2019, global brand development, innovation, advertising, and marketing services consultancy GERTRUDE, INC. has fortified its 5-year foothold in Chicago’s Pilsen district with the purchase of a contiguous seven-lot, 35,000 square foot property situated in the heart of the highly buzzed about neighborhood that was recently named by FORBES as one of the Top 12 Coolest Neighborhoods in the world. Located at 1725-41 W. 21st Street, the bi-level warehouse building dates back to 1914, in its early years hosting local retailers including a bakery, and most recently housing a large cold storage and pallet factory. For the enduring structure’s next life, GERTRUDE intends to create a concept with the agency’s own mark of design craftsmanship, imagination, and branding that will see closer collaboration between GERTRUDE’s clients, consumers, and a wide array of disciplines across the creative community, as well as align with Pilsen’s reputation as a forward-looking hub for the city’s creativity and culture. The entrepreneurial spirit and passion for ideas that have been GERTRUDE’s hallmark as a leader in the marketing innovation space make this move a natural evolution toward the agency’s next exciting chapter of inspiring tomorrow’s leaders. When completed, the renovated structure will become the new global HQ for GERTRUDE, INC. and the agency’s two divisions OZ MFG. COMPANY (Design) and RAYE (Experiential & Architecture). The building will also offer a range of desirable rental opportunities including Offices, Membership for co-working, private Events, Pop-Ups, and Production Studios, along with a suite of amenities. 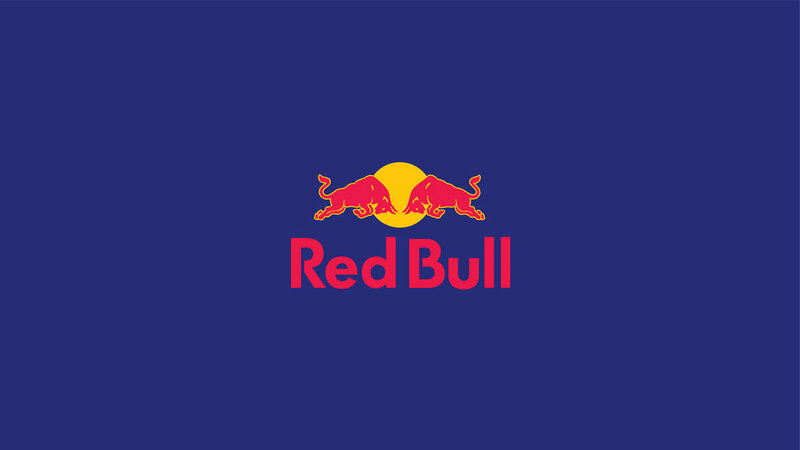 JULY 01, 2018 - Red Bull Media House has tapped GERTRUDE’s strategic and creative leadership to help shape and activate the organization’s global brand partnerships development, across Red Bull’s core channels spanning culture, music, sports, and e-sports. JUNE 01, 2018 - PepsiCo.’s design and innovation has brought on GERTRUDE, OZ MFG. COMPANY, and RAYE for a high-profile assignment for its premier NFL Tailgating program that will coincide with the launch of Pepsi’s newly launched “Generations” campaign. APRIL 01, 2018 - Leading industrial restoration equipment brand Therma-Stor PHOENIX has enlisted the brand development and innovation expertise of GERTRUDE, Design division OZ MFG. COMPANY, and Experiential & Architecture division RAYE to refresh and relaunch the 20+-year-old brand on mission to become the #1 name in restoration equipment. GERTRUDE, OZ MFG. COMPANY, and RAYE will handle all aspects of the brand re-launch spanning Brand Positioning and Strategy, Brand Identity, Packaging Design, CGI / 3D Imaging, Brand Films, Advertising, Digital, Sales Collateral, and Retail. FEBRUARY 03, 2018 - GERTRUDE has led new product and brand development for the launch of a craft beer by Nevin’s Brewing Company named Midnight Pig Beer. The Nevin’s Brewing Co. brand, a subsidiary of Sonas Hospitality Company, has also been refreshed by GERTRUDE, and the brewery will produce Midnight Pig Beer in Plainfield, IL. The Midnight Pig Beer brand centers on Chicago’s infamous beer brewing past with the same spirit and innovation that came from the original prohibition-era trailblazers, who needed their secret concoctions to speak for themselves. Under the cover of darkness, these innovators transported their concoctions in unmarked mason jars nicknamed “pigs.” From a time when originality was paramount GERTRUDE gave the signature line of eleven beers a name, Midnight Pig, as well as a new brand story, naming, strategy, brand identity, packaging design, advertising, brand films, collateral, P.O.S., trade, consumer materials, and design of two Midnight Pig Tap Rooms. Midnight Pig celebrates an infamous era of novelty, an era that can only be described by the brand’s tagline, “Notoriously Authentic,” to bring you beers such as: “Shamefaced”(German-style Pilsner), alluding to the shame that came with being caught bootlegging, “Wishful Thinking”(Belgian-style Dark Ale), to the hope that Prohibition would end, “Good Governor” (American Double Red), in honor of Illinois Governor Henry Horner who announced the repeal of Prohibition, “Zicke Zacke” (German-style Märzenbier), in honor of the traditional German toast, “Apocalyptinator” (German-style Dopplebock), in reference to the fear of Prohibition, “Bootlegger’s Paradise” (Belgian-style Saison), an homage to the modern-day bootlegger, “Hook & Hatchet” (Vienna-style Lager), a temperance-movement weapon of choice, “Secret Passage” (Imperial Stout) and “Divine Trickster” (Belgian-style Witbier), a nod to Prohibition’s underground dealings and dealers, “Tumultous” (IPA), an embodiment of the calamity during Prohibition, “Snitches Get Stitches” (Robust Porter), attributed to the no nonsense attitude of the times, and Pinched (IPA), to raise a glass to those who got caught in the game of quenching thirsts. APRIL 04, 2018 - A twenty-foot-long shipping container, painted bright red on the side of Pilsen’s Lacuna Artists Lofts building, marks the main entrance to the offices of the creative agency GERTRUDE. Step inside and you’re met with GERTRUDE’s industrial-meets-mid-century-modern aesthetic. Housed in the same space—and using that same vibrant color palette with a touch of distinct steampunk style—are the agency’s separate design division, OZ MFG. COMPANY, and their newly launched Experiential, Branded Architecture, & Environmental design division, RAYE. MARCH 09, 2017 - GERTRUDE, INC., the Chicago-based boutique ad agency, has been handed something close to a mission impossible. But one that will be fun to carry out, no matter how challenging. GERTRUDE has been tasked with developing the advertising strategy for the rollout of the SafeHouse Chicago, a spinoff of a 50-year-old Milwaukee institution that Marcus Hotel & Resorts has, in rather covert fashion, brought to the Chicago market. MARCH 01, 2017 - Following GERTRUDE’s successful launch of Around The Bend Beer Co., the agency’s Design division OZ MFG. COMPANY has been tasked to continue overseeing the brand development and packaging design for several new variants: ATB Beer Co. Mr. Marmalade, an imperial IPA brewed with Seville Oranges; ATB Beer Co. Villainous, the portfolio’s flagship IPA; and ATB Beer Co. Vera, a Pistachio Cream Ale. “Around The Bend is an exceptional product, and now a very distinctive brand that equally embodies a sense of curiosity and exceptional quality that play very well among craft beer drinkers,” said GERTRUDE and OZ MFG. COMPANY Founder, CCO Otis D. Gibson. “We’re very excited to continue helping lead ATB Beer Co. in defining what’s next in craft beer invention”. ATB’s Mr. Marmalade glows in the glass, flavor filled bossy bitterness that is smart and tart, sultry and sweet. Seville oranges are the foundation of the classic British marmalade. They lend an astringent bitterness that gives the jam its distinctive flavor. The blending of Seville oranges with orange blossom honey and loads of American hops delivers a compelling balance of sweet orange flavor and intense, long lasting bitterness. Mr. Marmalade plays with the palate, stimulating the senses and satisfying ounce after every golden, copper ounce. Villainous is ATB’s wickedest brew yet. West Coast meets British-style IPA—loaded with Centennial, Simcoe, and Mosaic hops for grapefruit and passion fruit overtones. It’s the most diabolical of plans. Instead of a single yeast strain, Villainous employs four; two British and two West Coast, to make one Super-IPA strain. This imparts subtle flavors like apple, clover honey and pear. A blend of the most coveted hops adds floral and fruity flavors in perfect compliment. A nefarious pleasure to be sure. Pistachios (species P. vera) have been used in culinary applications for thousands of years. For a much shorter period, innovative brewers have used them to add a luscious character to their beers. ATB Beer Co. Vera is a delicate Pistachio Cream Ale with Caravienne malt that adds a touch more body than some others might, yielding a very drinkable session beer you’ll want to get crackin’ with. Around the Bend’s steampunk-inspired creative direction was conceived and developed by OZ MFG. COMPANY, the Design division of global innovation, brand development, advertising, and marketing services consultancy GERTRUDE, INC.
FEBRUARY 15, 2017 - GERTRUDE has followed up on successful prior engagements for DIAGEO brands I.W. HARPER Bourbon and STUDEBAKER Expertly Crafted Whisky Cocktails with the awarding of branding duties for DIAGEO pillar spirit Ketel One Vodka. Ketel One Vodka was recently selected by Drink International’s 50 Best Bars Brand Report as the Number One (#1) best selling vodka. 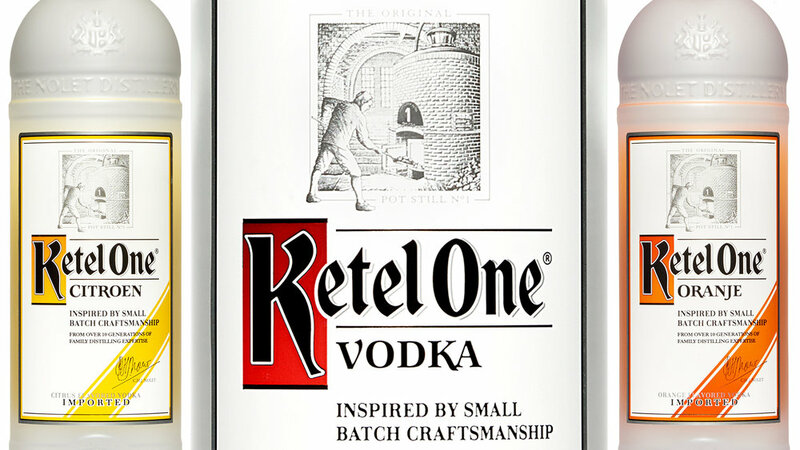 Since 1691 and spanning 11 generations, Ketel One Vodka merges old world pot-still perfection with meticulous modern day distillation. Celebrating over 325 years of inspiration and innovation Ketel One Vodka is as drinkable as it is distinguished, years of exacting expertise, producing a paragon of quintessential quality, the epitome of enjoyment. Ketel One’s embodiment of excellence is crafted to capture the essence of this experimentation, crispness, clarity, and silky smooth softness. The character of Ketel One is fabricated from the finest quality considerations, mastered through a pristine process, built on a long legacy of distillation excellence. GERTRUDE’s brand development for Ketel One Vodka captures the beauty of this brand’s exceptional heritage and superior attention to detail which produces “the perfect cocktails,” unique and unequaled. The qualities of Dutch distinction are also built into all aspects of the brand design, reflective in the care, obsessive craftsmanship, and remarkable values of the world’s superior spirit standard; Ketel One Vodka. JULY 15, 2016 - The renowned casual dining chain, famous for making Original Steakburgers™ and Real Milk Milkshakes since 1934, has awarded GERTRUDE creative duties focused on branding and outdoor. Steak ‘N Shake approached GERTRUDE seeking the agency’s expertise in Brand Innovation to reinvigorate its classic image and increase guest visits, kicking off with the development of a truly unique and buzz-worthy Outdoor Spectacular to be featured Nationally. GERTRUDE will focus on the brand’s unique heritage, hand-craftsmanship, and superior quality in its core offerings that has made Steak ‘N Shake the go-to family friendly establishment for over eighty years, with a vision to expand for generations to come. Shipping containers are at the center of the new Experiential & Architecture division at Gibson’s boutique ad agency GERTRUDE, INC. called RAYE—a named derived from Ray Eames, part of the famed husband and wife design team Ray and Charles Eames. FEBRUARY 15, 2016 - For this edition of Who is Who we bring you the founder and Chief Creative Officer of innovation, brand development, advertising and marketing services consultancy GERTRUDE, INC, Design division OZ MFG. COMPANY, and Experiential & Architecture division RAYE. With over 25 years of experience in almost all facets of advertising, he’s got some of the best and most innovative companies worldwide under his belt, including Google, Coca-Cola, McDonald’s, and Kraft, to name but a few. Otis himself holds an MBA from Steinbeis School of Management and Innovation. FEBRUARY 01, 2016 - Global innovation and brand development agency GERTRUDE, INC. officially announces the opening of RAYE—the agency’s new Experiential, Branded Architecture, & Environmental Design division that specializes in premium branded structures and environments, from concept and design to build and activation. Backed by GERTRUDE’s branding expertise, RAYE takes experiential to a completely new level, turning a brand’s strategic architecture into physical, branded architecture. In short, Branded Architecture is the sum of Strategy + Design + Architecture + Advertising. The launch of the new unit at GERTRUDE INC., which is now in its 11th year in Chicago, came, Gibson said, after his firm got more and more requests from clients to translate the agency’s success into developing and shaping brands into launch activations. “Clients increasingly are looking beyond traditional television and print ads,” said Gibson. So Gibson’s GERTRUDE and RAYE are doing a lot of experiential stuff with what is rapidly becoming a new signature offering—shipping containers. Now, Gibson’s may very well be the only Chicago ad agency that can say it specializes in premium-branded shipping container design, modification and activation. RAYE opens with several projects completed for the launch of two DIAGEO innovation brands: I.W. HARPER Kentucky Straight Bourbon Whisky and STUDEBAKER Expertly Crafted Whisky Cocktails. For the latter, RAYE redeveloped of a 20’ shipping container into a custom designed and fabricated “modern speakeasy” to introduce these premium, bottled whisky cocktails inspired by Prohibition era classics, the Old Fashioned and Manhattan. Designated internally as RAYE-1001, the “modern speakeasy” conjures the image of an exquisitely handcrafted whisky crate, featuring a burnt cedar clad exterior, wrap-around deck, reclaimed wood finishes, electrical, video and sound system, and dry bar. “1001” is one of a collection of branded environments to launch under RAYE’s belt that are also completely mobile, making RAYE fully adaptable not only to brands, but to locations and experiences across the globe. RAYE is currently developing several new projects for a number of clients, including a mobile classroom and a beer garden in Chicago’s booming West Loop. Another recent RAYE client highlight was a project for QSR giant McDonald’s called “McDonalds Contains Happiness.” The concept features a fleet of 40′ and 20′ Shipping Containers reimagined as the iconic McDonalds Happy Meal. The inviting, bright red structures, topped by the signature golden arches, emanate a large scale “happiness” centric to the classic menu item that gives consumers an opportunity to experience the world inside a McDonald’s Happy Meal. The fully mobile units are designed for turn-key activation, including electrical, HVAC, finished interiors, optional wrap-around deck, and portable generator. Finally, RAYE conceived and produced the agency’s striking main entrance, designed from a 20′ L x 8.5′ H shipping container, customized with glass and wood trim, and finished with the agency’s signature vibrant red color and branding. RAYE is led by GERTRUDE Founder, CCO, Otis D. Gibson, and agency President, Heather Knapp. JANUARY 01, 2016 - During the days of Prohibition (1919-1933), Canadian Whisky boomed in the United States, as whisky that had been legally distilled north of the border made its way to the millions of thirsty Americans hiding out in speakeasies across the country. Bartenders looking for quality spirits quickly became fond of the dynamically rich taste of Canadian Whisky and adopted it to craft cocktails like the Old Fashioned and Manhattan that embodied the era and would go on to become classics. Whether hosting friends and family or toasting to your favorite occasion, STUDEBAKER Expertly Crafted Whisky Cocktails take the guesswork and preparation out of serving these classics, allowing consumers to enjoy the perfect cocktail on any occasion. With STUDEBAKER Old Fashioned and STUDEBAKER Manhattan, an expertly crafted whisky cocktail is just a pour away. Arriving guests entered a converted 2200 Series CTA Train Car reimagined as a 1920s Club Car, complete with a custom branded exterior, interior signage telling the brand’s Prohibition era history adorned in Art Deco style, custom fabricated whisky crates, 1920s era swing jazz, and of course, bartenders serving up STUDEBAKER Cocktails. The WHISKY 6iX experience continued as guests exited the train car and stepped into a lounge resembling an oversized whisky crate. A secured sliding front door beckoned guests to approach and enter a private room custom designed for STUDEBAKER, including a short film showcasing the brand’s Prohibition backstory. This “modern speakeasy” lounge, designed from a 20′ L x 8.5′ H shipping container, was conceived and built by GERTRUDE’s new Experiential & Branded Architecture division, RAYE. JANUARY 01, 2016 - Following GERTRUDE’s successful re-launch of the legendary I.W. HARPER bourbon, DIAGEO’s Innovation team has enlisted the agency to lead strategy and creative for the launch of new-to-world brand, STUDEBAKER Expertly Crafted Whisky Cocktails. STUDEBAKER is a premium, full proof, crafted whisky cocktail featuring Prohibition inspired classics such as the STUDEBAKER Old Fashioned and STUDEBAKER Manhattan. Developed by historians and mixologists, STUDEBAKER masterfully blends the finest Canadian Whisky with select premium ingredients to replicate unique tastes of cocktail history, perfected from bottle to glass. STUDEBAKER’s elegant and contemporary art deco style packaging design furthers this story of exquisite quality rooted in Prohibition tradition. Creating a classic is the stuff of legend. During the days of Prohibition (1919-1933), Canadian Whisky boomed in the U.S., as whisky that had been legally distilled north of the border made its way to the millions of thirsty Americans hiding out in speakeasies across the country. Bartenders looking for quality spirits quickly became fond of the dynamically rich taste of Canadian Whisky, and adopted it for classic whisky cocktails like the Old Fashioned and Manhattan. The mythology of the Manhattan is lost in lore similar to the tales of the Old Fashioned. What we do know is that it all begins with whisky, Canadian, American, Irish, Bourbon or Rye, the Manhattan being a little sweet from the red vermouth and the Old Fashioned being sweet from a cube of sugar, a dash of bitters in the Manhattan, 2 dashes in the Old Fashioned with a splash of water to keep it all honest. Knowing these two standards is like knowing the gospels, two drinks; that tell a passion play of Prohibition, the possibilities of perfection and the art and science of the spirits. The current whiskey boom has led to a resurgence of these iconic drinks that consumers have once again adopted as contemporary favorites, and STUDEBAKER Expertly Crafted Whisky Cocktails have mastered this mixology, blending Canadian Whisky and key ingredients to deliver STUDEBAKER Old Fashioneds and Manhattans. Sip a STUDEBAKER Manhattan, perfected with sweet vermouth and a touch of bitters, garnished with a maraschino cherry. Enjoy a STUDEBAKER Old Fashioned, exquisitely executed with cherry, orange, and a touch of bitters, garnished with a simple orange peel. Whether hosting friends and family or cheering on your favorite team, STUDEBAKER takes the guesswork and preparation out of developing these classic cocktails, allowing consumers to enjoy the perfect cocktail on any occasion. With STUDEBAKER Old Fashioneds and STUDEBAKER Manhattans, an expertly crafted whisky cocktail is just a pour away. GERTRUDE developed the brand strategy, positioning, and creative for these “famed cocktails inspired by an infamous era” that introduced Studebaker to a modern audience with a taste for exquisite classic cocktailing. STUDEBAKER launched nationally via Trade, Print, Digital, Brand Film, and Retail. GERTRUDE also oversaw the brand launch event, held in Chicago, which featured the STUDEBAKER “WHISKY 6iX”—a converted 2200 Series CTA Train Car reimagined as a 1920s Club Car, along with a 20’ shipping container designed as a “modern speakeasy” lounge. 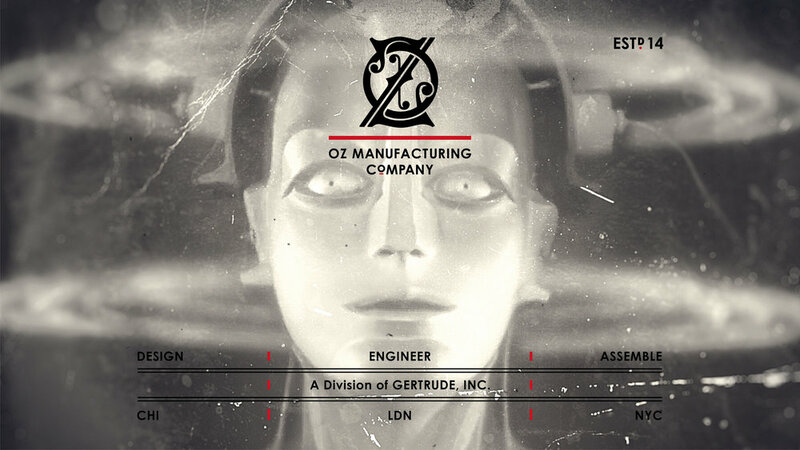 GERTRUDE’s Design division OZ MFG. COMPANY led the design of the campaign collateral and website, capturing the Prohibition age with a distinct look featuring 1920s style tin type and Art Deco graphics befitting the era that inspired STUDEBAKER’s classic whisky cocktails. GERTRUDE’s Experiential & Architecture division RAYE conceived, built, and activated the STUDEBAKER “Whisky 6iX” experience. DIAGEO is the world’s leading premium drinks business with an outstanding and unparalleled portfolio of alcohol beverage brands across spirits, beer and wine. These brands include Johnnie Walker, Crown Royal, J&B, Windsor and Buchanan whiskies, Smirnoff, Ciroc, Ketel One vodkas, Baileys, Captain Morgan, Tanqueray and Guinness. DIAGEO is a global company, with its products sold in more than 180 countries around the world. The company is listed on both the New York Stock Exchange (DEO) and the London Stock Exchange (DGE). Celebrating life, everyday, everywhere. JULY 01, 2016 - More train track lines radiate in more directions from Chicago than from anywhere else in the United States, making Chicago a crucial railroad center to North America. In the middle of Chicago, at the heart of the railways, is the ever-adapting village of Pilsen. The neighborhood has transformed over the years, but at the turn of the century Pilsen was at the heart of the industrial hub in the city and central to the accessibility of the city’s railroads and highways. Now in yet another exciting chapter, today’s Pilsen is also recognized as a leading creative hub in Chicago with some of the strongest artistic presence in the city. The area is home to thousands of artists, hosts hundreds of galleries, and is the location of the city’s monthly Art Walk. From industrial center to artistic community, Pilsen has a unique and compelling history. One that can’t be told without acknowledging Pilsen as the historical home to a number of key buildings, businesses, and influencers in the city’s rich past. One of those buildings, located at 2150 South Canalport Avenue, stood a century ago as largest pasta producing factory in the country, called the Viviano Macaroni Company. Today, the revamped structure is a creative business professionals mecca situated in the heart of Chicago’s Pilsen arts district, and the home to the HQ office of GERTRUDE, INC., a global innovation, brand development, advertising, and marketing services agency. Upon moving into the building’s loading dock, GERTRUDE had its eye on an exceptional property poised for transformation and brand activation sitting in the parking lot just outside the agency—retired CTA Train Car No. 2238. For many years, those who lived in Chicago navigated the city in a 2200 Series stainless steel train car. The iconic railcar series was in service from 1969-2013 and primarily used on the CTA Blue Line. The train cars were the first of their kind. Designed by the Budd Company in Pennsylvania, the 2200 Series became an iconic standard for those traveling in between Forest Park and O’Hare by creating a streamlined commute from the suburbs into every part of the city. Only 150 of these train cars were ever made. Ten remain, existing in museums or used in movies, but most were sold for scrap. Living in the 2150 S. Canalport parking lot is one of the final surviving cars from the 2200 series built in 1967. CTA CAR NO. 2238. With the building being a thriving creative community, as well as an integral part of Pilsen’s popular artistic scene and a one-of-a-kind destination in Chicago, naturally GERTRUDE saw an added opportunity to seamlessly integrate 2238 OFF THE RAILS into this culture. 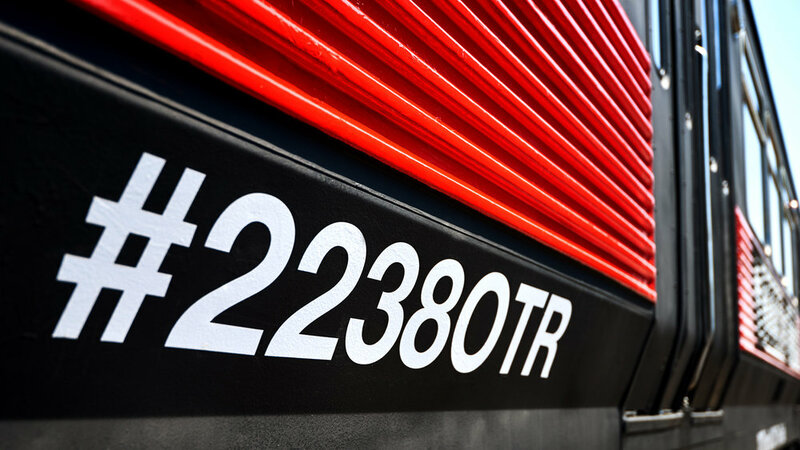 Recognizing the train car’s unique potential, GERTRUDE approached the property management with a name and brand activation concept to launch the train car as a brand new event venue called 22Thirty8 Off The Rails. Car 2238, now simply dubbed “OFF THE RAILS,” has been repositioned, rebranded, and re-launched by GERTRUDE in collaboration with agency’s Design division OZ MFG. COMPANY and Experiential & Branded Architecture division RAYE, as a 380 sq. ft., premium gallery and activation space featuring hard wood flooring, media capabilities, a service dry bar, and numerous interior/exterior branding opportunities. CTA Car #2238 takes a new leap forward as a premier event space that can host a wide variety of experiences, both inside the car and on its adjoining deck, making it the only premium space of its kind in Chicago, appropriately location in the city’s vibrant, industrial Pilsen Arst District. The venue is ideal for private events, tastings, screenings, and temporary creative workspace. Further tying in with the community, 22Thirty8 OFF THE RAILS will also host OTR movie nights, screening movies filmed in Chicago on the 2nd Friday of each month to coincide with Pilsen’s monthly “2nd Friday” art walks. These events will be invite only, uniting influential members of the tenant community and professionals in Pilsen. 22Thirty8 OFF THE RAILS will also serve as an international artist showcase, featuring artworks by premium, globally renowned artists, commissioned on a periodic basis to paint the train exterior. GRAB A GLASS AND SOME ROCKS. THIS ONE’S GOING TO BE GOOD. APRIL 01, 2015 - Global premium spirits giant DIAGEO enlisted GERTRUDE, INC. to lead strategy and creative for the renovation and re-launch of an internationally renowned, iconic bourbon brand making a landmark reunion with the U.S. market. GERTRUDE initiated strategic and creative duties for the DIAGEO Innovation team with the redevelopment and re-launch of the legendary, 142-year-old I.W. HARPER bourbon brand, which returns to the U.S. for the first time in nearly 20 years with the release of two new, unique offerings: I.W. HARPER Kentucky Straight Bourbon Whiskey, and a limited release of I.W. HARPER 15-Year-Old Kentucky Straight Bourbon Whiskey. The storied brand is returning home after a long journey spanning 110 countries. Tasked with “modernizing a classic,” GERTRUDE applied the agency’s leading expertise in Brand Innovation and Brand Renovation to reposition, revitalize, and re-launch the I.W. HARPER brand in a memorable way befitting its remarkable history and premium positioning. The new “Welcome Home Mr. Harper.” campaign launched in several key markets including Louisville, Chicago, and Portland, via Trade, Print, Digital, Brand Film, and Retail. The campaign also features a custom I.W. HARPER 1928 Ford Model A Huckster. The custom branded showpiece was conceived, sourced, designed and produced by GERTRUDE’s Design division, OZ MFG. COMPANY, along with the agency’s Experiential & Architecture division, RAYE. The vehicle was featured at the I.W. HARPER Chicago PR launch event on March 26th and will live permanently in the I.W. HARPER room at the Stitzel-Weller Distillery in Louisville, Kentucky. The I.W. HARPER brand launch came at a perfect time for GERTRUDE, following the agency’s ten-year anniversary on February 1st, a milestone celebrating GERTRUDE’s longstanding foundation in innovation. The I.W. HARPER work debuted Spring 2015. OCTOBER 23, 2014 - On Thursday, October 16th, GERTRUDE & the ART DIRECTORS CLUB delivered a resoundingly successful inaugural MAGIK MACARONI to a packed house. The 400+ crowd, comprised of agencies, production companies, photographers, designers, artists, and students, came together to partake in an evening dedicated to inspiring Chicago’s creative community through a showcase of global creative innovation. From 6-10pm, guests gathered at GERTRUDE’s building at 2150 S. Canalport Ave. to mingle and tour the Global ADC Awards Traveling Exhibition, watch The InspirADCion Film Series featuring legendary ad man Lee Clow, and view an exclusive screening of the 2014 ADC Tomorrow Awards. As a special addition to the festivities, the night kicked off from 4-6pm with the “Let’s Make The Industry 50/50” photo shoot, an initiative celebrating equal gender representation in the creative communications industry. The photo captured a remarkable group of 80 of Chicago’s female creative leaders, making it the third successful “50/50 initiative” photo taken in major cities following New York and Toronto. MAGIK MACARONI title sponsors included global innovation, brand development, advertising, and marketing services agency GERTRUDE, INC., OZ MFG. COMPANY (GERTRUDE’s Design division), ART DIRECTORS CLUB Global, and Leo Burnett. Supporting sponsors included Luerzer’s ARCHIVE, OKRP, Optimus Design, Resolution Productions Group, SID LEE, Shutterstock, and All Rise Brewing Co. Sponsors for the 50/50 Initiative Photoshoot included Energy BBDO, SAROFSKY, The Colonie, and Creative Niche. “We are absolutely thrilled by the turn-out and positive energy that was shown for MAGIK MACARONI. We look forward to Chicago’s creative industry growing its relationship with ADC, giving us the platform to bring even more new ideas and experiences to inspire this great community,” said GERTRUDE Founder, Chief Creative Officer, Otis D. Gibson. SEPTEMBER 09, 2014 - Following the success of GERTRUDE’s inaugural event with the Art Directors Club last year, on October 16th, 2014, GERTRUDE, OZ MFG. COMPANY, and the ADC will step things up with the presentation of MAGIK MACARONI, an event focused on innovation in advertising and design that will rally Chicago’s creative community around the ADC to celebrate the very best in creativity. Just as MAGIK MACARONI is about inspired ideas, so its name stems from an inspired combination: the famed Chicago Magikist sign and the historical Viviano Macaroni Company—once home to the largest macaroni producing factory in the US and now a creative business professionals center. MAGIK MACARONI will deliver an experiential evening presented through installations and activities curated by the ADC. Some MAGIK MACARONI highlights include The InspirADCion Film Series featuring legendary ad man Lee Clow, the iconic designer Ivan Chermayeff and famed agency architect Clive Wilkinson, an exclusive screening of the 2014 ADC Tomorrow Awards, and the Global ADC Traveling Exhibition. Partners from the advertising, production, and creative industries have joined GERTRUDE and the ADC to create a truly inspiring event—including title sponsor Leo Burnett, as well as supporting sponsors SID LEE, Shutterstock, Resolution Digital Studios, OKRP, Optimus Design, Luerzer’s ARCHIVE, Berlin School of Creative Leadership, and Creative Niche. MAGIK MACARONI will take place on Thursday, October 16th at 2150 S. Canalport Ave. Transportation service will be provided to/from event with pick-up/drop-off at 35 W. Wacker Drive. Tickets must be purchased in advance. GERTRUDE AND OZ MFG. COMPANY SIGN AROUND THE BEND BEER CO.
APRIL 01, 2014 - Around The Bend Beer Co. has appointed GERTRUDE and Design division OZ MFG. COMPANY as lead strategic and creative agency to handle duties supporting the brand development and launch. A shared vision and passion for innovation brought Around The Bend, GERTRUDE, and OZ MFG. COMPANY together and will be the foundation for showcasing “what’s next” in the world of craft beer. “Brewing innovation is at the heart of Around The Bend’s approach to craft beer” said Dan Schedler, Founder of Around The Bend Beer Co. “GERTRUDE and OZ Manufacturing Company intuitively understand marketing innovation. It’s not only a complement to our philosophy, but an invaluable asset to shaping and launching a new craft beer brand that will stand out on shelf. GERTRUDE will handle brand positioning and strategy, advertising, and social media for Around The Bend, while GERTRUDE’s Design, Branding, and Production division, OZ MFG. COMPANY, will oversee identity, packaging, digital, and collateral design. MARCH 01, 2014 - GERTRUDE’s OZ Manufacturing Company welcomes AB InBev to its family of global brands. OZ MFG. COMPANY has picked up several assignments for AB InBev’s Innovation team within the Bud Light / Bud Light Lime portfolio, as well as several confidential new products. OZ MFG. COMPANY will handle portfolio, strategy, branding, product naming, and packaging design. FEBRUARY 01, 2014 - GERTRUDE has officially opened OZ Manufacturing Company, specializing in Design and Branding. OZ MFG. COMPANY is a division of GERTRUDE, INC., a full service, independent global innovation, brand development, advertising, and marketing services consultancy. OZ MFG. COMPANY further extends the agency’s focus on innovation, strategy, and creative with a global team that specializes in corporate identity, brand management, product development, packaging, structural design, retouching, CGI / 3D imaging, and photography.